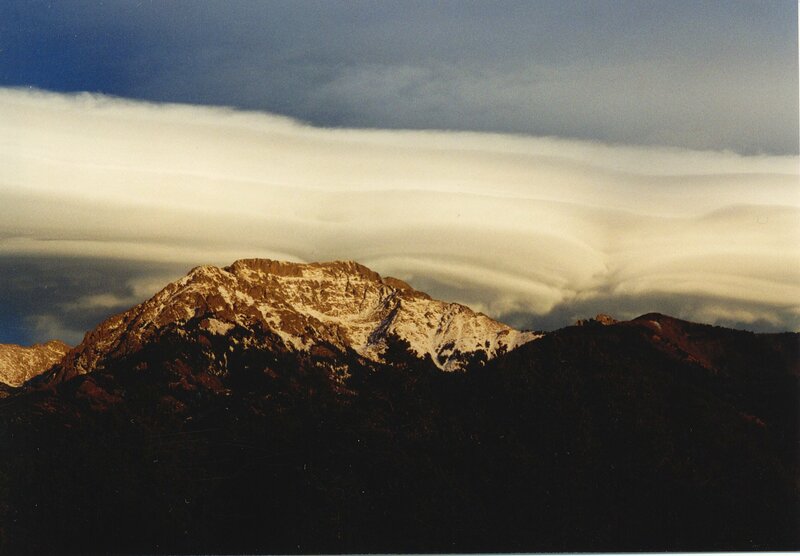 Home »Geographic Setting»Geology of the San Luis Valley: What priceless treasures are buried here? Geology of the San Luis Valley: What priceless treasures are buried here? The San Luis Valley is part of the Rio Grande Rift system that extends from central Colorado southward through New Mexico, Texas, and into northern Mexico (Figure 1). The rift began to form about 28 million years ago during the Oligocene Period when a largegraben began to sink along deep bounding faults (Figure 2). Geologic cross-sections through the valley indicate two major half-grabens, including the Baca Graben to the east and the Monte Vista Graben to the west (Figure 2). These half-grabens are filled with some 10,000 to 15,000 feet of Tertiary volcanic rocks (from the San Juan Mountains to the west) and alluvial and lacustrine sediments such as the Sante Fe and Alamosa Formations. 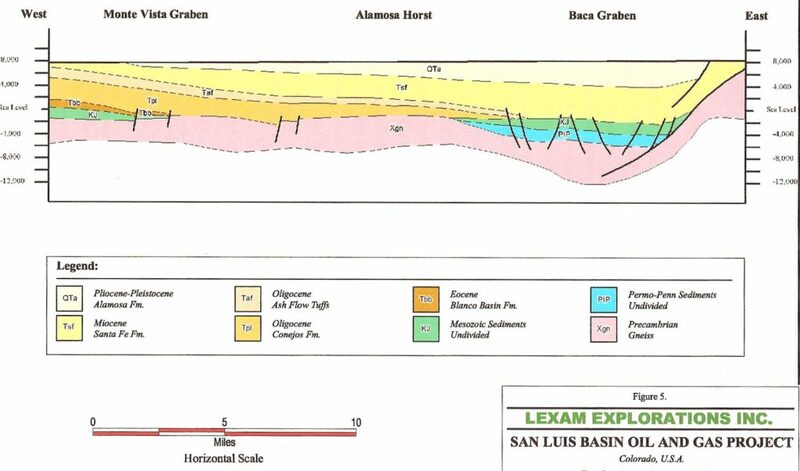 1) Over 15,000 feet of sediments, and sedimentary and volcanic rocks fill the eastern portion of the San Luis Basin called the Baca Graben (Figure 2). 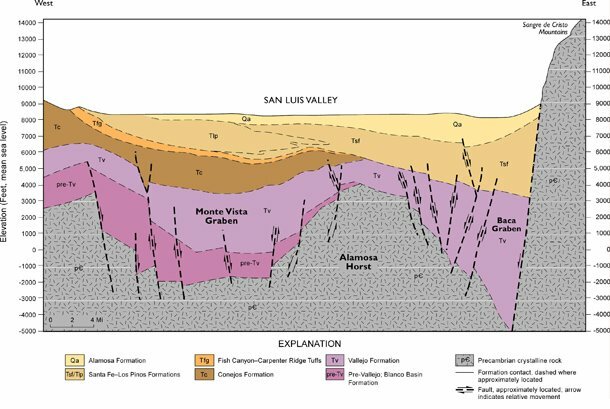 2) A series of high angle normal faults have displaced geologic strata over the past approximately 28 million years to form the San Luis Basin (Figure 2). 3) Vast reserves of Pleistocene groundwater are stored in the sediments and sedimentary rocks of the Baca Graben. Potable water (upper 2000′) in the confined aquifer is estimated at over 140 million acre-feet. 4) Most sediments and sedimentary rocks in the Baca Graben are younger than about 28 million years old. Thus, Mesozoic source rocks for gas and oil do not occur in significant quantity in the San Luis Basin (Keller and Cather, 1994). 1) There probably was no significant accumulation of sediments during the Mesozoic (about 250 to 65 million years ago). 2). Most or all of any sediments deposited during the Mesozoic were probably eroded and removed during regional uplift during the Laramide Orogeny (between 65 to 50 million years ago; Brister and Chapin, 1994). 3) Rifting began about 28 million years ago simultaneously with the outpouring of volcanic rocks in the San Juan Mountains. 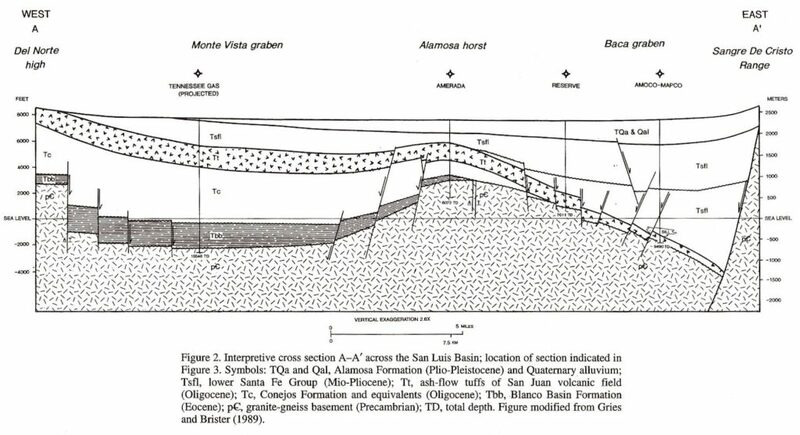 Geologic cross-sections by Brister and Greis (1994) and Tweto (1979) (Figures 3-a and 3-b) show the major geologic structures as well as the estimated ages of sediments and rock formations in the northern San Luis Basin. 4) Thus, basin fill in the Baca Graben consists mainly of upper Oligocene to middle Pleistocene sediments (up to 5.6 km thick), comprised of mudstones and coarse lithic sandstones and conglomerates, that overlie Precambrian bedrock (Chapin and Cather, 1994; Kluth and Schaftenaar, 1994, Brister and Greis, 1994; Brister and McIntosh, 2004). These conclusions are based on seismic, gravity, and well data, as well radiometric dating and geologic mapping. Again, none of the geological experts recognize the presence of Mesozoic hydrocarbon source rocks in San Luis Basin. Furthermore, Kluth and Schaftenaar (1994) conclude the angle of the (east) bounding fault of the Baca Graben is about 60º, with 45º as an absolute minimum angle. Another piece of evidence suggesting no commercially significant amounts of hydrocarbons are present is that samples of gases in hydrothermal waters at local hot springs do not show significant quantities of hydrogen sulfide or organic molecules associated with fossil fuels. (Drs. Karl Karlstrom and Laura Crossie, Department of Geology, University of New Mexico, personal communication, 2008). In contrast with all other geologists, Lexam Explorations, Inc.’s geologist, Thomas Watkins, authored a 7-page report postulating that Mesozoic source rocks are abundant in the San Luis Basin. This paper has not gone through the standard scientific review process; i.e., it has not been checked, evaluated, and verified by other scientists. Nonetheless, Watkins justifies his conclusions based on re-interpretation of seismic data in addition to well data acquired in 1992 and 1993. Hoey et al. 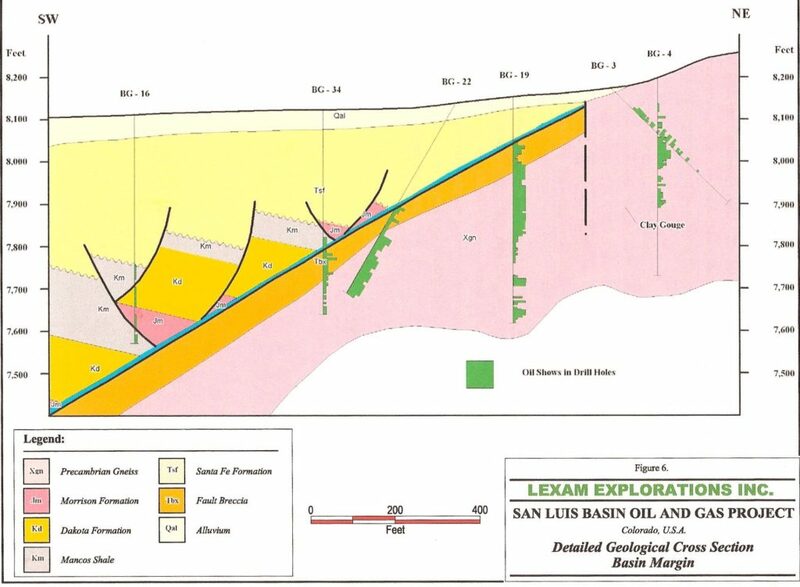 (2006) indicate that “live oil” was encountered in 27 mineral exploration holes drilled in 1992 and 1993. These “oil shows” were supposedly present in a “concealed seep” in a four-mile stretch along the eastern margin of the basin (Figures 4, 5 and 6). Figure 4. 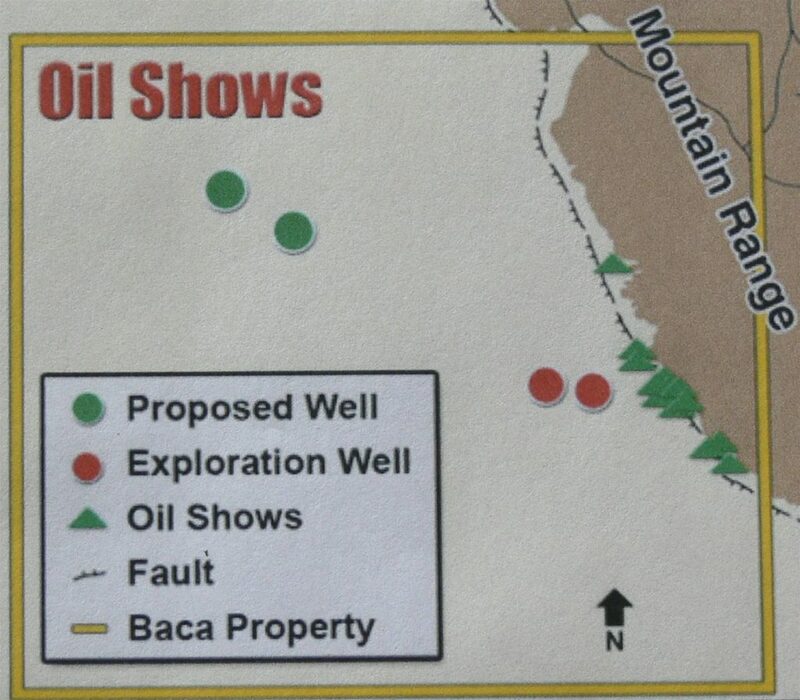 Location of “oil shows” (green triangles), Baca #1 and #2 wells (red circles) and proposed well locations (green circles) (from Lexam website). Figure 5. 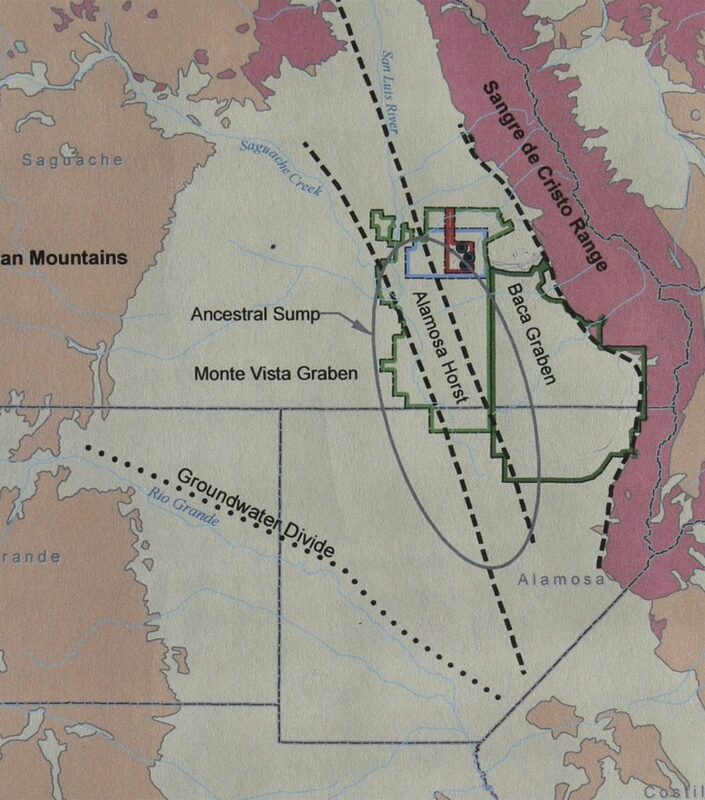 “Oil shows” (green triangles) along Sangre de Cristo fault along eastern edge of San Luis Basin. Figure 6. Lexam’s (Hoey et al., 2006) interpretation of sub-surface stratigraphy based on six test wells (BG 3, 4, 16, 19, 22, and 34). Note: “oil shows” in drill holes (green color), rotated fault blocks, and supposed presence of Mancos Shale, Dakota Sandstone, and the Morrison Formation. 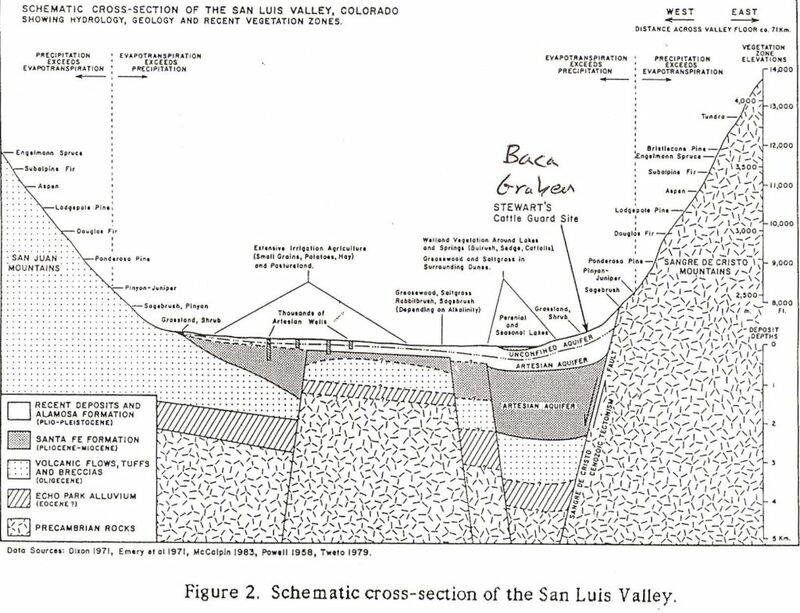 Watkin’s/Lexam’s geologic interpretation differs significantly from all other geologists in that they show Mesozoic source rocks along rotated blocks in the hanging wall of a low-angle (25 to 30º) normal fault that forms the (eastern) margin of the San Luis Basin (Figures 6 and 7). Note that Watkins (2005) claims that Baca #1 and #2 Wells (7000+’ and 5000′ deep) encountered Mancos Shale and traces of oil (Figure 8). The strongest “oil shows” were supposedly present in a 350′ section of Baca #2 Well starting at 6620′ (2000 m). Figure 8. Lexam’s interpretation of stratigraphy, faults based on Baca wells #1 and #2. Although Watkin’s paper has not gone through the accepted scientific peer-review process, it nonetheless provides the scientific basis for the report prepared by Toronto-based consulting group, Watts, Griiffiths and McQuat (Hoey, et al., 2006) that Lexam is using to justify its drilling program and fund-raising efforts. 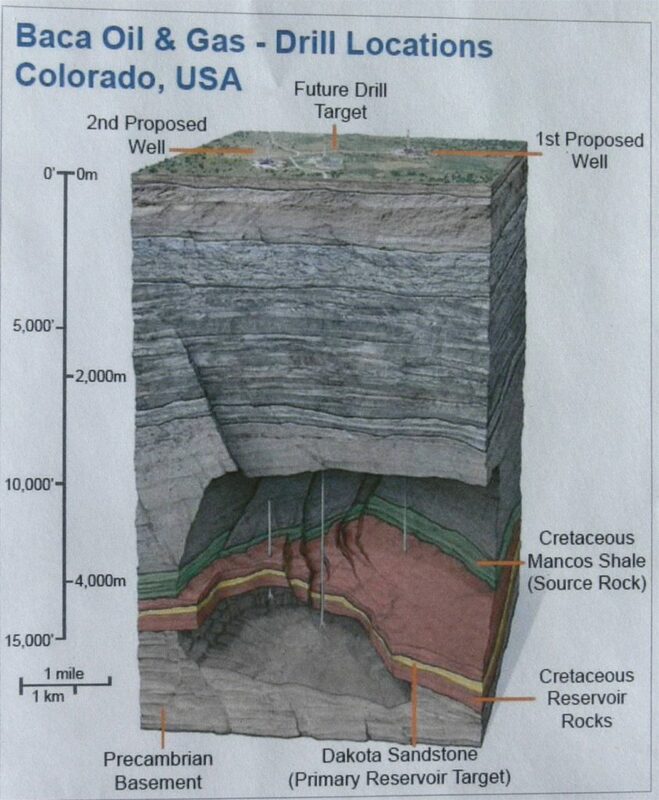 As of January, 2008, Lexam’s website (www.lexamexplorations.com) indicates their recent 3-D seismic survey suggests their target Mesozoic rocks (Dakota Sandstone and Mancos Shale, Figure 9) occur at the base of the pile of sedimentary rocks near 14,000 foot depth. Figure 9. 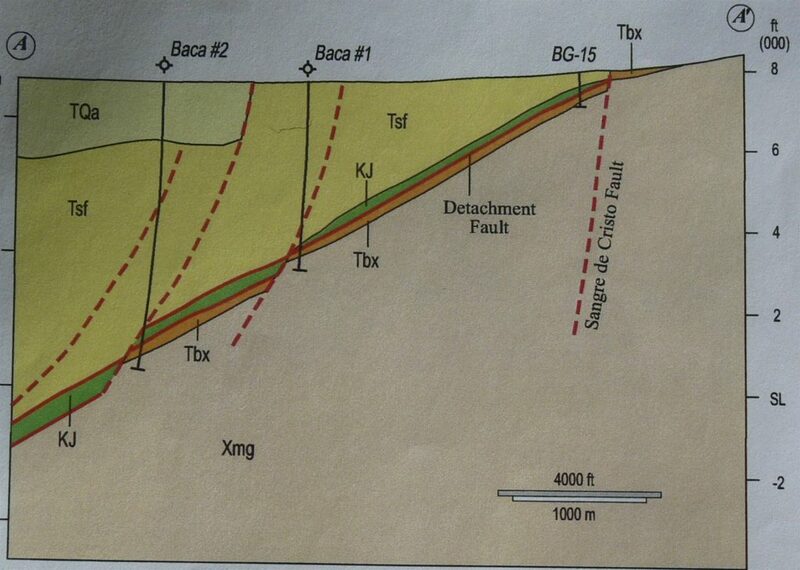 Intrepretation of stratigraphy under proposed wells #5 and #6 based on seismic data. Figure 10. General Geology as in the Draft Environmental Assessment. Note they extend the Baca Graben east to the mountain front and that it includes the Baca Grande community as well the Great Sand Dunes National Park and Preserve. Whose Interpretation Should We Believe? Could This Be A Water Play in Disguise? 4) Alternatively, if their geologic interpretations prove correct and there are commercial quantities of natural gas present here, would Lexam and/or Conoco-Philips quickly add other wells all over the San Luis Valley, including our Baca Grande community andThe Great Sand Dunes National Park and Preserve? Certainly, much of Lexam’s interpretation is based on claims of “oil shows” in test wells. Are they real or conjured? Based on the proprietary nature of information gathered by the oil and gas industry, it is difficult to know for sure. NORTH AMERICA’S LARGEST BODY OF UNTAPPED, CLEAN WATER?! Regardless of which geological interpretation is correct, Lexam’s drilling of three 14,000’ exploratory wells could directly and adversely affect the quality and quantity of groundwater in the San Luis Valley aquifers. Natural gas, oil, and drilling fluids each can contaminate precious groundwater. While we do not know if there are commercial quantities of gas or oil in the valley, we can be more certain that a vast reservoir of groundwater is here and is priceless. Geologic/hyrdrologic studies from the mid-1970’s conclude that sediments underlying the San Luis Valley contain one of the largest freshwater aquifers in North America. Indeed, the confined aquifer here is estimated to hold 140+ million acre-feet of recoverable water that is worth an estimated 770+ trillion dollars! Indeed, this may be the largest untapped aquifer in North America! The still-pristine and unspoiled San Luis Valley itself is the world’s largest and highest alpine agricultural valley. The Valley itself is about 8,000 square miles, or about 122 miles long and 74 miles wide. The only surface water leaving the San Luis Basin is the Rio Grande River, which is fed by streams from the Sangre de Cristo Mountains and the San Juan Mountains. Groundwater in the unconfined and confined aquifers is separated by an impermeable layer of clay. 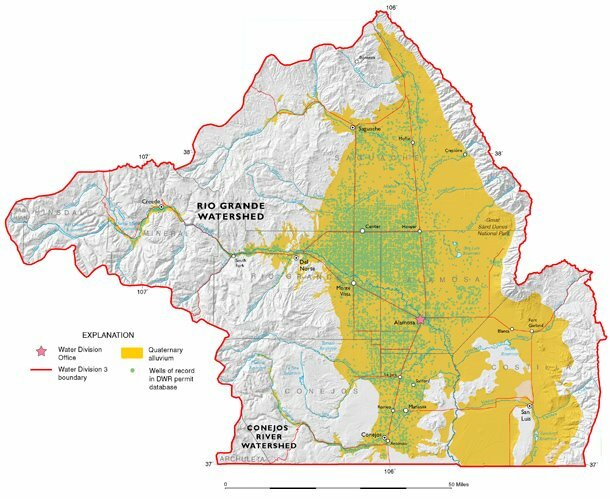 The unconfined aquifer consists of the upper 40 to 180 feet of groundwater that feeds directly into the Rio Grande River. Rio Grande River water, the only surface water that leaves the Valley (Figures 1 and 2), is allocated to three states (Colorado, New Mexico, and Texas) and Mexico under the terms of the Rio Grande Compact. The much more massive confined aquifer, which is under artesian pressure and extends downward thousands of feet, actually probably consists of between 30 and hundreds of separate but connected aquifers. It may be inferred that there is mixing of the unconfined and confined aquifer waters in some places and under some climatic regimes. Figure 12. Upper portion of the Rio Grande Basin, including the Closed Basin of southern Colorado (from the Ground Water Atlas of Colorado). As described in WWA Page 2, two decades ago, Canadian Maurice Strong, of American Water Development, Inc. (AWDI), attempted to reap billions of dollars in profits by exporting the groundwater of the confined aquifer to the Denver area. After this plan was defeated by local ranchers and environmentalists, local entrepreneur Gary Boyce proposed a similar plan. Boyce planned to charge $5000 per acre foot. At this price, the value of water from this aquifer could be on the order of $700+ billion! Thus, it is clear that the potential value of potable water stored in the San Luis Valley far exceeds any potential, short-term bonanza of natural gas. And the tragedy and criminality of starting a full-scale gas production operation in this Valley is that such an operation would almost certainly contaminate the aquifer. Then this enormous sub-surface pool of fresh water would then not be available to future generations. This groundwater provides water for agriculture, for communities, and for wildlife and future generations will depend on it. Water from the unconfined aquifer is within 7 feet of the surface in some locations in a highly permeable sandy soil. Any surface disturbance or spill due to drilling operations has the potential to impact the groundwater quality adversely. Thus, contamination of this unconfined surface aquifer could mean the loss of our groundwater resource for generations. In addition, it could have very negative impacts on downstream users of the Rio Grande River in New Mexico, Texas, and Mexico, all of which have treaty rights to surface water, which is affected and supplied by the much larger quantity of groundwater in the confined and unconfined aquifers here. Certainly, more specific information regarding groundwater flow directions is needed. The interconnection and interaction between surface water (streams and wetlands) and the unconfined and confined aquifers also needs to be evaluated. Specifically, more data is needed on the potential impacts of drilling on each of these interrelated parts of the surface water/groundwater system. Thus, a thorough evaluation of the groundwater system and a full Environmental Impact Study (EIS) should be completed before any drilling at all is allowed. Lexam’s drill play on the newly-formed Baca National Wildlife Refuge is indeed a special situation, wherein a federally-owned area set aside for the protection of the area’s unique and fragile ecosystem, has a privately-held mineral right. At federal sites where significant impacts anticipated, the National Environmental Policy Act (NEPA) require that a full Environmental Impact Statement (EIS) be conducted. In conclusion, groundwater, not natural gas, is the San Luis Valley’s most precious resource. It supports our lives and livelihoods. It is essential for the survival and well-being of future generations. It’s ownership and use is regulated by a complex set of laws involving several basin states as well as Mexico. Thus, it seems common sense that the water rights and surface-owner rights (especially those of a federally-protected Wildlife Refuge) should be given higher priority than a speculative mineral right owned by aforeign corporation. And the potential contamination (or potential theft by secretive and perhaps illegal tactics) of this vast reservoir of groundwater is an unacceptable risk which should preclude any drilling in this sensitive area for perpetuity. 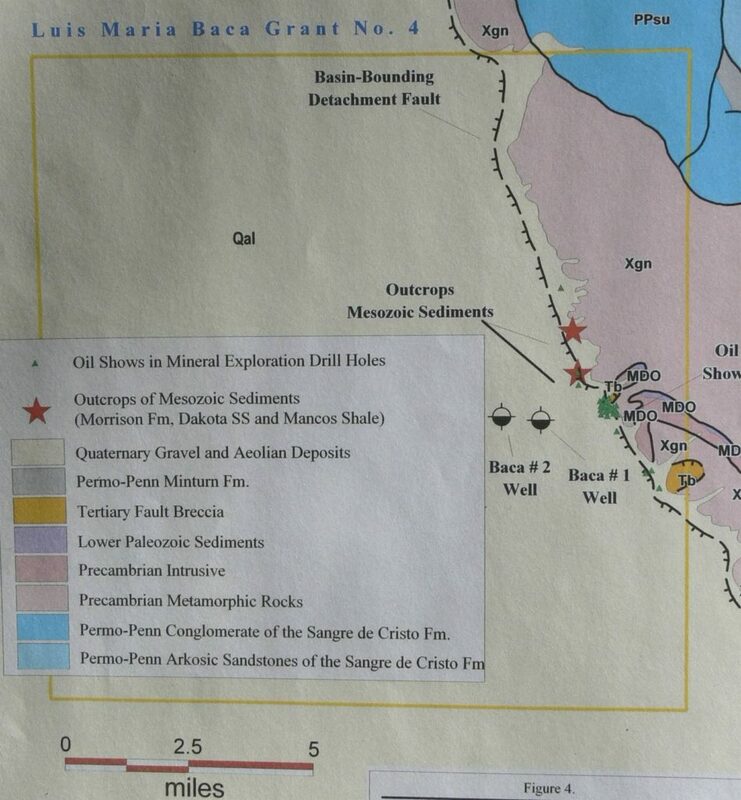 Mexico Bureau of Geology and Mineral Resources, Bulletin 160, p. 281-296. Paper 291, Boulder, CO, p. 5-25. McCalpin, J.P., 1982, Quaternary geology and neotectonics of the west flank of the northern Sangre de Cristo Mountains, south-central Colorado, Colorado School of Mines, Quarterly, vol. 77, no. 3, 97 pp.